Go for maximum impact with this strong horizontal design perfect for display at retail or home. Fabricated from mahogany wood with a high-gloss finish, it has a four sided windowed enclosure that offers 360 degree viewing. The three Spanish cedar slatted display shelves are set at a 45 degree angle for easy accessibility, and come with six dividers. 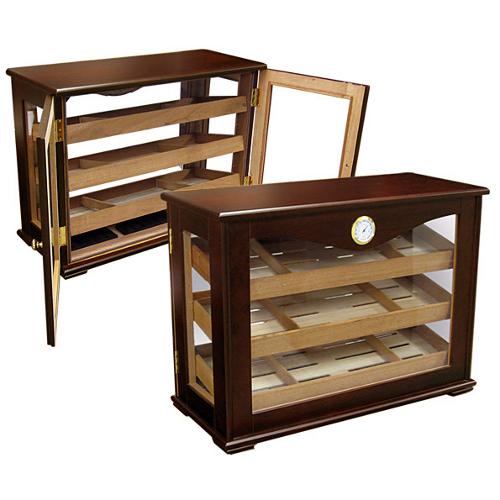 Featuring a gold-plated lock and key, two humidifiers, and a front mounting analog hygrometer, this humidor is a great vessel for any cigar collection.